Northampton moved into the Premiership top four with a bonus-point victory over Harlequins at Franklin's Gardens. Saints prop Alex Waller bundled over and Courtney Lawes added a second, but Tim Visser showed electric pace to give Quins a 13-12 half-time lead. Quins extended their advantage as Jack Clifford ran in from 40 metres but Ben Foden's try put Saints back in front. Ben Botica missed two crucial penalties for the visitors before Harry Mallinder dotted down Saints' fourth try. 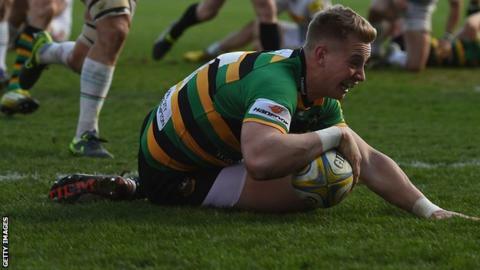 Saints now face two crunch games in their bid to make the play-offs as they travel to third-placed Wasps on 3 April, before hosting Leicester, in fifth, on 16 April. Harlequins' hopes of sneaking into the top four are fading as they sit six points behind Saints and still have to travel to leaders Saracens before hosting second-placed Exeter on the final day. With the hosts 22-20 ahead Botica, who had been faultless from the tee all afternoon, missed a difficult kick from 45 metres and then sliced an easier attempt wide of the uprights. Teenager Mallinder, son of Northampton director of rugby Jim, then made sure of the bonus point as he finished off George Pisi's initial burst. Northampton Saints: Foden; K. Pisi, G. Pisi, Burrell, North; Myler, Dickson (capt); Waller, Haywood, Brookes, Craig, Lawes, Gibson, Wood, Harrison. Replacements: Marshall, Ma'afu, Hill, Matfield, Dickinson, Fotuali'i, Hanrahan, Mallinder. Harlequins: Brown; Walker, Marchant, Roberts, Visser; Botica, Care (capt); Marler, Gray, Collier, Merrick, Horwill, Clifford, Wallace, Easter. Replacements: Ward, Lambert, Sinckler, Luamanu, Robshaw, Dickson, Hopper, Chisholm.